Discussion in 'The Hornets' Nest - Watford Chat' started by reids, Jan 31, 2019. First off - what does it all mean? xGChain90 = Players can be involved in the creation of shots/goals and not get much credit as they don't get either the key pass or the assist. 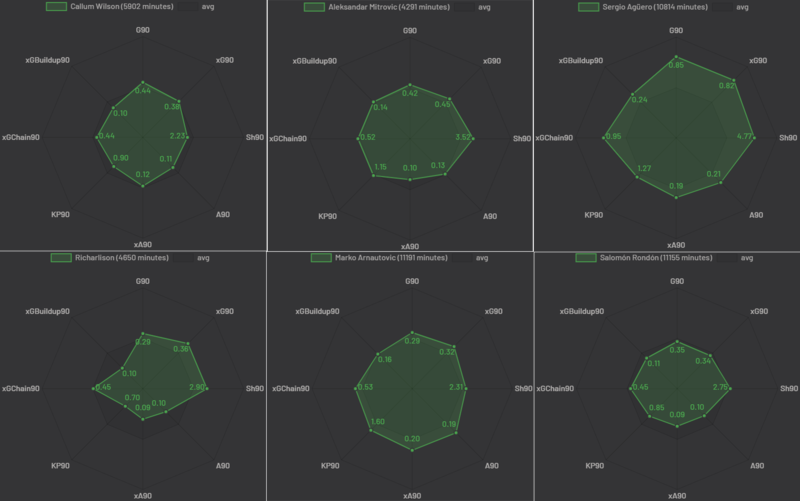 xgChain changes that by working out how many sequences of possessions the player is involved in and all the shots created by that then works out their xG to work out how much each player is involved in the creation of shots. xGBuildup90 = Basically the same, but with shots and assists removed to focus purely on the build-up play rather than the end result. Deeney: Doesn't take that many shots, with the lowest numbers out of anyone except Deulofeu (which isn't surprising since Deulofeu has largely played on the wing at every club he's been at), looks decent enough at creating chances although I'm surprised his xGchain and xGbuildup numbers are so low, if I'd blind guessed at those numbers I woulda put them higher - but all in all Deeney can pretty much be classed as an all rounder. Deulofeu: Unsurprisingly as he's spent most of his time on the wing, his creative numbers are much higher than his goal-scoring numbers. We've all seen his finishing this season and know he's not destined to carry on playing up front, and the numbers match that. Gray: Very similar profile to Deeney, jack of all trades - master of none, although his profile is slightly leaning towards more of a goalscoring striker rather than Deeney who's numbers are very slightly more geared towards creating. Success: Not great goalscoring stats, with fewer goals than he should have scored, especially considering the amount of shots he takes. Creates a decent amount it seems as well, but nothing to write home about. Cucho: A very similar profile to Success, with pretty poor goalscoring stats but decentish numbers for creating chances. Still very young though and has had to deal with a massive step-up in league quality from last season (would love to see these same stats for last season) in a terrible team. 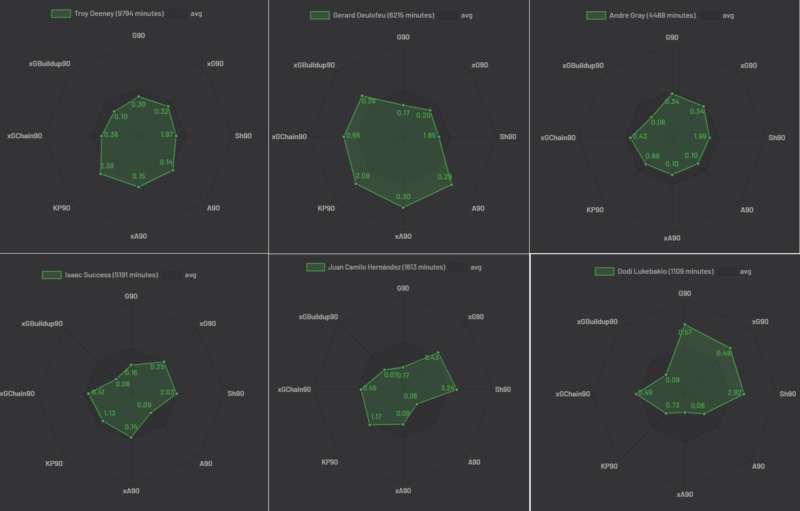 Lukebakio: The goalscoring numbers are through the roof, with basically nothing offered in terms of creation. Completely different profile to anyone else we have at the club. So what does this mean for next season? Firstly, we have enough strikers that I'd shift Deulofeu back to the wing where he'd likely be better utilised. Success and Cucho have very similar profiles - so both aren't needed, although I'd definitely keep one of them in the first team, either loan Cucho out to a better team and let him develop and keep Success or keep Cucho, let him acclimatise to the PL and then sell Success. Gray and Deeney also have similar profiles so both not needed. I'd *probably* side with Deeney, although Deeney does turn 31 in the summer whilst Gray is 3 years younger. Interested as to what others would do...other than sell them all and buy Messi's little toe. Bwood_Horn, Pob, Beekayess and 20 others like this. Next year has got to be about seeing if Lukabakio is the real deal, the lad looks mustard and has been finishing with either left or right. 11 in 17 I think for the half season? I'd have offloaded Gray already, god knows what he's still doing here. I'd keep Deeney but only if he understands he's not automatic first choice, the club needs to look beyond him. Success has potential but needs to show it, a 12 month loan into the championship might be the best thing. Agree Delia should be right wing, in a 4231. Junk this stupid 442 / 4222. Thanks for the post. Interesting read, even if it sort of confirms most of what we knew about our strikers; most of them are bang average - below average. Agree that Deloufeu will hopefully make his way back to the wing, although I don’t think he’d offer enough defensively in our current setup for Gracia to use him there. That might change if we sell Bobby P and end up finding a superior option up top. 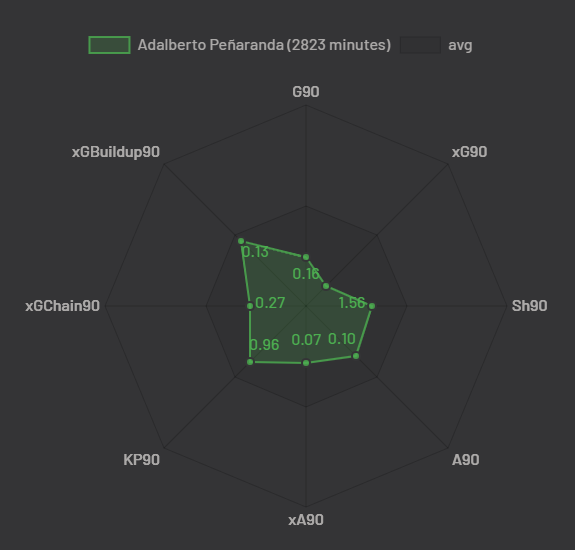 Telling that Peneranda doesn’t even have stats for this, due to his lack of game time. His development has been severely disrupted. Hope we’ve learned a lesson from his case. Might not be too late for him, but he’s going to have to make an impact quickly to have a chance of being a success with us. Great stats. I would personally sell Success and loan Gray for s season. Deeney is our talisman of sorts. He could play a sort of Holebas role, mainly defensive but chip in with an odd goal. Pendz needs to start at least one full game just to see how he copes, Delafoo is not a striker and with Decoure’ on his way most likely, having him back in a more natural position can only be beneficial. I actually completely forgot about him, it has his spells at Granada, Udinese and Malaga, but the stats are pretty forgettable with a similar profile to Deulofeu (not surprising considering he spends most of his time on the wing) but far inferior. All very interesting @reids . And not to set you homework or anything, but how do our strikers compare to others in the PL around our level? Say Richarlison, Wilson, Arnautovic and the like. There must be relatively small margins? Can you take out penalties from the goal stats (especially for Deeney)? Also, going by that Cucho's finishing appears worse than Success' - if so then I hope he stays well away from our first team for a good while. You're correct in identifying that Lukebakio looks like he could be suited to playing the role we currently ask of Deulofeu, enabling Deulofeu to move back to the wing. It will be interesting to see what the club decides to do with him after assessing him again in the summer. In an ideal world we'd get in a new striker who would have Deulofeu's stats but without the big gap in his finishing ability (I also expect if we took Deulofeu's stats for this season his expected goals would be higher). Always got something interesting to say, Reids, I'll give you that. On the topic of strikers: Happy Birthday Luther. When I saw the charts, my first thought was "swarfega". Now, there was a striker. He would still do well in the modern game. Didn't Spain play for a while without a recognised forward? I didn't take a lot of notice when they did it, do you think we have the players to implement that kind of system Reids? In my head (which has very little tactical nous) I imagine playing a fluid front four with the players at our disposal (barring further loans or sales). So, for example, Pereyra & Deulofeu starting wide as in the current system and, say, Penaranda & Hughes central. Hughes sitting a little deeper. But that would merely be where they sit on the team sheet. In reality they would move/swap positions with each other on a relatively constant basis, dragging less disciplined defenders out of position for one of our four to exploit. Less disciplined CBs often look for someone to mark when a CF isn't naturally occupying a space near them so this may leave gaps to exploit also if we don't have a CF pushed right up on them all of the time. Lukebakio & Cucho, I think, could be swapped for any of the names above. When we don't have possession may prove a problem! It would require each player needing to read runs from opposition full-backs & midfielders, dependent on where they are when/if a move breaks down for us, so our own more defensive players aren't overloaded, especially out wide. Two of Capoue/Cleverley/Chalobah/Doucoure/Quina would occupy a central midfield pairing. If one of our full-backs pushes on I'd expect one of the CMs to either fill the space or drop into central defence so a CB can go wide to cover the FB. The keeper will be in skins and have a free role! Or we could just go 4-4-2 and have the same discussion every season because we're not in the market for a £50m forward who can guarantee goals. Hoping instead that our creative players offer up enough chances for our forwards to score from while chipping in with a few themselves. Coming up shortly, surprisingly isn't much difference until you move up to the Aubas, Kanes, Manes, Agueros etc. Personally I don't think we're capable of such a system, Spain were only capable of it due to the incredible batch of midfielders they had who all complimented each other perfectly who could keep possession until the chance was put on a plate for someone - we simply don't have the midfield for that so it'd have a negative impact as to playing "normally" in my opinion. I seem to recall Chelsea doing that recently (can't remember whether it was under Conte or Sarri) using Hazard as the false 9 and it didn't go well, if Chelseas midfield can't do it, we can't! I'd managed to forget the Chelsea example completely, imagining it would be easier to implement at club level than international. Thanks for all the breakdowns, fascinating insight. Isn’t this where we came in before we found that none of our strikers could play upfront by themselves? Can any outside the top 6 does this? 7 years ago last night we had to flog Marvin Sordell to a big PL team (BWFC) for financial reasons. The same night we won 2-0 at Millwall with TD scoring one of his early goals for WFC. That summer BWFC were relegated and the Pozzo Era began. Marvin Sordell has mainly moved around the lower leagues since then, taking years to equal the number of goals he scored in 81 games for WFC. I wonder if he would have prospered under the Pozzos in the way that TD has done? Bwood_Horn, RookeryDad, EB Hornet and 2 others like this. Who is this Aguero bloke. given he has the biggest green blob, worth a punt? Beekayess and EB Hornet like this. I'd happily pay my money to see us try it. I'd imagine there would have to be a lot of work done on the training ground for any possible success to come from it. Wilson, Mitrovic and Arnautovic are all better all-round strikers than any of ours based on those graphics, and are more than capable of being lone front men - though I didn't really need those graphics to work that out already. The stats for Murray could also be solid, and it'd also be interesting to see how Batshuayi fares (though he's perhaps more of a poacher, and not so creative or strong at holding the ball up, meaning he might not be as suited to being a lone front man). Regarding Mitrovic, I've been sceptical about him in the past, largely because he sometimes seems a bit lethargic and misses lots of chances (and also is a bit of a plonker at times), but after seeing him play more this season I reckon he'd make an excellent Deeney replacement should Fulham get relegated (which seems likely) . His movement and aerial ability are excellent, and despite missing chances he still bags plenty of goals. The Pozzos would still be unlikely to pay the kind of transfer fee a relegated Fulham might ask for though, even though he's a good age and ready-made solution. For us a ‘one up top’ striker would be like 2 players as it frees up a midfield place. In the Prem, you have to be strong to play this role. As well as good control/good awareness for passing/etc. Would Pen or Luk be physically up to it? I actually find him the opposite of lazy. He’s always charging around the opposition defenders and giving them grief. He seems to have tailored that better this season and kept within the rules rather that when he was at Newcastle. Obviously he would have favoured Fulham given his previous loan, but always thought it was a shame we didn’t go in for him in the summer. Good attainable player at what was a good achievable price IMO. Think bigger clubs would be in for him as their backup striker if Fulham go down sadly. Doesn't strike me as a man who'd be happy as a backup option. Even then, I could only think of Chelsea out of the top 6 who could possibly accommodate him should they wish as a replacement for Giroud in being back-up to Higuain. Beyond them, I could only envisage Everton (unfortunately) as being a PL club slightly above us in the pecking order that may want to push the boat out for a first choice striker of his profile. I might have also said West Ham, but that seems less likely if Arnautovic is staying for good. Were none of those three clubs to really make a push to get him then I reckon we'd stand a pretty good chance, should we have the desire. His issue was more about his mentality than ability. If you look at the strikers we had when we were in our pomp in the Championship he wouldn't have had a sniff anyway. Maybe not. But money does talk and never count out the ego of a PL footballer to think he’s better than anyone else. Could see him at Spurs, Chelsea...and although they are in our range, Everton and WHU would likely happily drop a fortune in wages on him.